The best smoker grill is one that works well whether for tailgating or those weeknight meals. For the top seven grills reviewed below, we focused on ease-of-use in addition to cooking versatility and durability. Customer reviews were taken into consideration also. As such, the grills are listed based on rating (lowest to highest). In the end, you’ll have an easier time finding the best smoker grill for your needs. This grill grants you more control and makes clean-up simple with the adjustable ash pan. There are also slide-out coal drawers to add coal without removing grates. Moreover, with the two wheels, you can move the grill easier. You can also check out some of the best charcoal grills available on the market today. Additional features include two shelves, a built-in temperature gauge, and an airtight flanged hood to fight off bugs and debris. However, some modifications may be needed as quality control isn’t always high. For instance, air can get in, letting the smoke out. Another noteworthy aspect is that the coating may be prone to chipping/burning off. This comes in four colors: black, brown, blue, and red. It has a double-wall insulated design to use less charcoal for less airflow and greater heat. As such, this can be used for slow and long cooking or quick cooking. Heat control is steady, but it may take some getting used to even with the gauge. Other features include two locking wheels, an ash pan and bottom damper, and a folding side shelf as well. Even with the 22 gauge steel and cast iron construction, some material can seem low in quality (e.g. cracking grates and loose bolts on locking lid). This product is both a kamado cooker and a smoker grill. This Pit Boss grill is fueled using 100% natural wood pellets. It features a digitally controlled burn system that provides a heat range from 170ºF (76.7ºC) to 600ºF (315.6ºC). To keep the flame alive, there’s an electric ignition alongside fan-forced air acceleration. Its arch design allows that air to circulate evenly for uniformed heat. Though it can provide uniformed heat, it can struggle to maintain temperature settings if the “P” setting is high. Something to keep in mind is that this grill performs better when using Pit Boss brand pellets over another manufacturer’s. Check our best wood pellet grill recommendations. 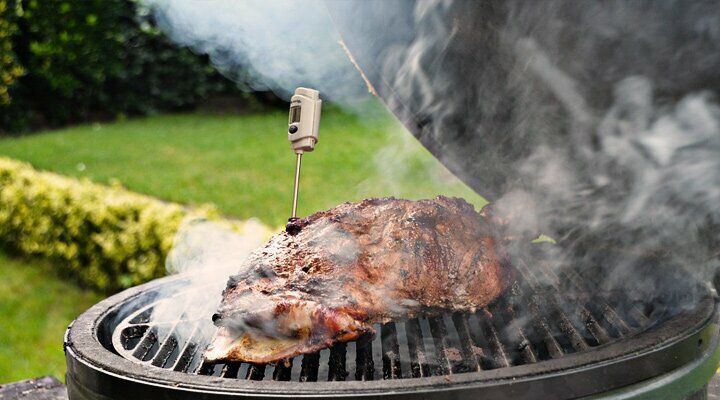 Available in blue or bronze, the Traeger Grill & Smoker uses original wood pellets with an integrated digital controller that can reach up to 450ºF (232.2ºC). It’s seen by many as the best smoker grill for transportation due to its EZ-fold legs; this turns the grill compact for greater portability. This has a 6-in-1 versatile design so you can BBQ, smoke, grill, bake, roast, or braise. When you receive the grill, it comes partially assembled, and finishing it typically takes little time. However, one concern is that the auger can stop working. For temperatures, this grill has a range from 160ºF (71.1ºC) to 500ºF (260ºC), and the sear box can get up to 900ºF (482.2ºC). It has “Smart Smoke” technology to attempt to maintain smoke setting and temperatures. However, you may still have some trouble keeping the temps where you want them. It has a large cooking area on both the grill and sear box to provide you with more options as to what you want to grill, bake, smoke, etc. More features include a meat probe, warming rack, four wheels, ash and pellet hopper cleanouts, and a bottom shelf. Though it may require a learning curve to use, assembly and set-up are simple. It has a built-in temperature sensor and a range from 160ºF (71.1ºC) to 450ºF (232.2ºC). This is the best smoker grill with an 8-in-1 design and a large cooking area to accommodate anything you have. It is consistent in terms of temperature. For cleanup, there isn’t an ash or hopper cleanout, but maintenance is still straightforward. To protect the grill, it comes with a waterproof cover. The best smoker grill on our list is a classic PK Grill & Smoker. It comes in graphite or silver, and it features a retro design in an egg-like shape made from a rust-resistant material. In addition to being lightweight, the oven can detach for easier cleaning as well as quick portability. It has 4-way venting for more heat efficiency. However, the cover and base can have some gaps, so it isn’t always airtight. Also, though it isn’t that big, it can work as an all-around grill. For those who want the option to smoke and grill from the same product, it’s beneficial to find a good smoking grill combo. The best smoker grill should offer you the necessary versatility, but should also feature user-friendly traits (quick cleanup, portability, etc.). Used any of the grills on our list or know of some we didn’t feature? Let us know in the comments.